Remove any knobs or sliders that will restrict you from being able to remove the top portion of the MIDI keyboard's plastic body. These usually come off by simply pulling them firmly upward. Do not shake or rattle them because you could damage the actual pots. Remove the small screws that hold together the top and bottom portions of the keyboard's plastic body. These screws are usually on the bottom half. 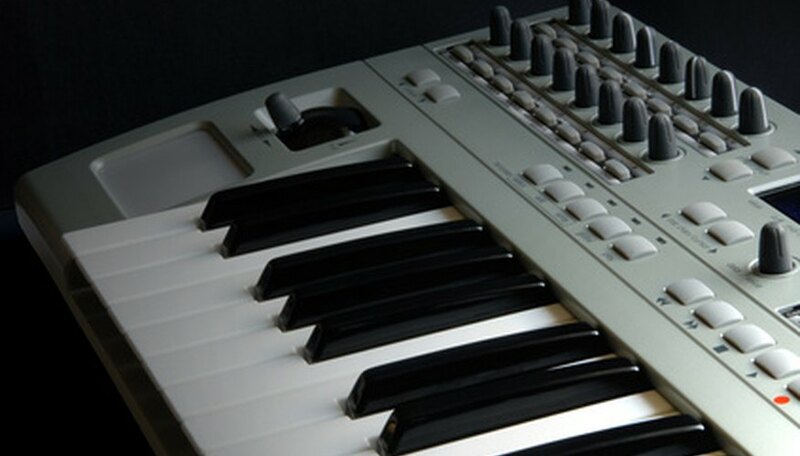 Separate the top and bottom portions of the keyboard's plastic body to gain access to the MIDI keyboard's inner components. Locate the circuit board that interacts with the keys. It should be a long, thin circuit board that stretches the length of the keys. Remove this circuit board by removing the small screws that attach it to the keyboard's frame. Depending on the design of the MIDI keyboard, you may need to remove other components before gaining access to the circuit board. Take pictures with a digital camera if you think you will forget how to reassemble the keyboard. Locate the button contacts that interact with each key of the keyboard. These are almost always covered by a series of gray or black rubber buttons attached to the keyboard. Remove the rubber buttons and clean any dirt, hair or other debris that has worked its way into the button contacts to interrupt the signal. Use 90 percent isopropyl alcohol and cotton swabs. Test the keyboard to make sure it is functioning before attaching the body. Clean it again if needed. Make sure none of the keyboard's inner components is in contact with any screws, a screwdriver or other metal. Never work on your MIDI keyboard while it is being powered by your computer. Turn it off. Keep track of all knobs, sliders and screws.